What is a Home Improvement Contractor License? the repairing, remodeling, altering, converting, or modernizing of, or adding to, residential property and shall include, but not be limited to, the construction, erection, replacement, or improvement of driveways, swimming pools, siding, insulation, roofing, windows, terraces, patios, landscaping, fences, porches, garages, solar energy systems, flooring, basements, and other improvements of the residential property and all structures or land adjacent to it. “Home improvement” shall also mean the construction of a custom home, the installation of home improvement goods or the furnishing of home improvement services. If you are performing work that falls under the definition then you must hold a license. In fact, if you do not have a license you are likely committing a crime and are waiving any right to payment! If I Have a Suffolk County Home Improvement Contractor License is that Enough? Well, maybe. It depends on where you are performing the work. 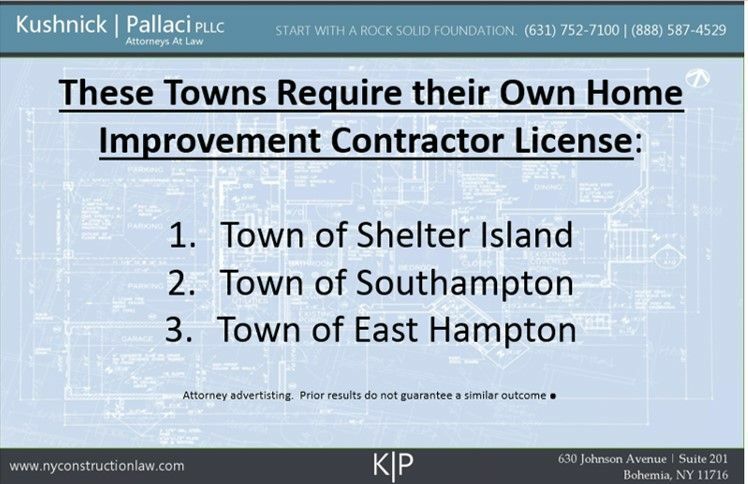 If you are performing home improvement work within Suffolk County then your license allows you to perform that work anywhere within the County unless the local municipality has its own licensing requirements. 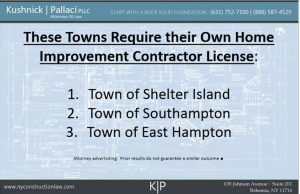 What Municipalities in Suffolk County Have Their Own Home Improvement Licensing Requirements? What is the Definition of Home Improvement Work in those Jurisdictions that Require Their Own License? The repairing, remodeling, altering, converting or modernizing of, or adding to, residential property and shall include, but not be limited to, the construction, erection, replacement or improvement of central air conditioning, awnings, bathrooms, cabinets, carpentry, central vacuum cleaners, chimneys, decks, dormers, drainage systems, extensions, flagpoles, fumigation, heating, kitchens, masonry, painting, railings, renovations, sprinklers, storms and screens, tennis courts, tile installers, ventilating, water weatherproofing, driveways, swimming pools, siding, insulation, roofing, windows, terraces, patios, landscaping, fences, porches, garages, solar energy systems, flooring, basements, erosion protection structures and improvements, such as a jetty, groin, revetment, breakwater, bulkhead, geotube, sandbag installation or other artificial beach nourishment project which requires a permit pursuant to Chapter 111 or 138 of the Town Code, improvements made pursuant to Chapter 123 or 169 of the Town Code to bring residential property into conformance with applicable flood prevention regulations, including, but not limited to, placement of structures on pilings or relocation of structures, and other improvements of residential property and all structures or land adjacent to it. “Home improvement” shall also mean the installation of home improvement goods or the furnishing of home improvement services. Because performing work without a valid license absolutely voids any right to payment, it is crucial that you obtain a license and know what jurisdiction you are working in. If you end up in litigation you could very well not be able to collect payment for otherwise properly performed work. Contact one of our construction attorneys now to discuss your home improvement contractor license issue including disputing violations. This entry was posted in Home Improvement Contract and tagged Home Improvement Contractor by VTP. Bookmark the permalink.